Technically, I don’t own this book (yet), but my sister does and I’ve used recipes from it in the past so I feel that I’m in a good enough position to be able to offer up my opinion of it. This books title is also a great description of what it contains. 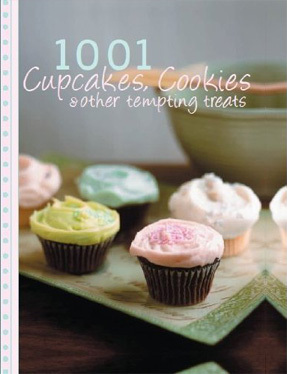 It has hundreds of recipes for cakes, cookies, slab cakes, cupcakes, muffins, brownies, scones, biscuits and more! Not the thing to consider getting if you’re currently on a diet as it’s almost certainly going to make you want to bake loads of things that you shouldn’t! Part of this is due to the stunning pictures of the cakes and other recipes. One of the things I always look for when buying any cookery books is ones that have photos for every recipe and this book fits my requirements to the letter with some truly inspirational photography of the things that you can make. Even the healthiest of people will be tempted, especially with some of the cakes as some of them look like you can almost smell and taste them…..on that note when is someone going to release a ‘scratch and sniff’ cake book, as I would be all over that like a fat kid on a cake.